Who knew lunch with vegans would be so lively? Sarah and Tanya with Post photographer (and vegetarian) Carlo Allegri. 'Mom, it's not a religion," I say when she asks about the vegans I'm interviewing. "Yes it is, dear," she insists. "You're thinking pagan," I tell her. "Well, then, what nationality are they?" she wants to know. The friendly pierced and tattooed authors, Tanya Barnard and Sarah Kramer, look healthy, I think, considering they've been vegan for years. What do they eat anyway? And then our mighty healthy National Post photographer Carlo Allegri, who's here for the shoot, astounds me by announcing that he's vegetarian himself. "I put in for this assignment days ago," he tells me enthusiastically. Wonders never cease. Great enthusiasm abounds at the restaurant. The authors (whose first book is called How it All Vegan) are obvious celebs in these parts. But there is a tense moment when our vegan server takes one look at Carlo, and they both start to blush. Carlo spills the beans when the girl walks away, explaining that when he first met her at a party a few months ago, in his words, "I said hello, and then I broke wind." "Were you vegetarian at the time?" I ask. As it turns out, he was. (Now we're getting somewhere.) As politely as possible, I ask the girls if "wind" is a troublesome side effect of a vegan diet. They admit that it is. "Sure, you eat a lot of beans," says Sarah, "but it helps if you chew on digestive enzymes." Option two, says Sarah, "is that you can always leave the room," or option three, "you can just embrace them [the toots]." Yes, this is going to be an interesting lunch after all. 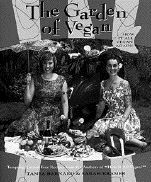 ...the cookbook, The Garden of Vegan. Sarah, who grew up in Saskatchewan, says that because of her hippie mom, hers was the only family in Regina in which the children grew up on "lentil leaves and carrot sticks." Although she did have milk as a child, she said that going from vegetarian to vegan was a natural progression. The Juice For Life vegan menu includes rice bowls, stews and noodles. Having trouble deciding, I ask the waitress to bring me a smorgasbord. Both Tanya and Sarah say they are vegan for emotional reasons. "We don't want to eat anything that is killed for food," says Tanya. "What about the poor plant that you're rending apart?" I ask. "There's evidence that plants have feelings too." "That's bullsh--," says Sarah quickly. "Then why not milk?" I ask them. (Both women believe in breast-feeding.) "It won't kill the cow." "Yes, but the cow didn't give his consent," says Sarah. We talk about the stigma of going vegan. Carlo complains, "My Italian father is still mad at me -- he thinks it's against God's law to be a vegetarian." Tanya, who was raised a meat-eater, admits that going vegan is still an issue with her family. "At Christmas," she says, "my mother will want me to have the traditional turkey, potatoes and overcooked vegetables." I ask the authors to put together an imaginary Christmas vegan dinner. "Tofu turkey," Tanya suggests, "done in the shape of a turkey." It is possible, they insist, but you can also try a turkey mould, if you have trouble. "But leave a space for the stuffing," says Tanya, suggesting a cranberry and brown rice dressing, to be baked with the tofu turkey. "In the stuffing, don't forget the seasonings," offers Sarah, "rosemary, onions, yams and poultry seasoning [for a real Yuletide flavour]." For dessert, the authors suggest pumpkin pie with tofu whipped cream. They tell me (not surprisingly) that the hardest place to get a vegan meal is in the air. "Flying here our [airline] meal [scrambled tofu] had hardly any spice, and we got a stewed tomato and a cold hard bun," Sarah complains. "Why should you be different from anyone else?" I say. "But the regular meal looked good," they tell me. I remind them that looks can be deceiving. An eating philosophy even more restrictive than vegan, I'm told, is Jainism. Adherents of Jainism, the oldest religion in India, are vegetarian and believe in "live and let live." "With that, you can only eat an apple if it has fallen off the tree, and you can eat the top part of the carrot because that doesn't hurt it. But you can't dig up potatoes -- they're hiding on you -- they have their rights as well," Sarah says. The women's vegan lifestyle is more manageable, says Sarah, "because we're from the West Coast [Victoria]. This is more common out there, we're more relaxed." I ask if there are vegan comfort foods. "Mashed potatoes with spicy flaxseed oil," says Sarah. "Veggie stews with miso [fermented soybean paste] gravy, for me," says Tanya. Our lunch arrives. I'm having what the menu describes as the Warrior (a curried brown-rice concoction with bok choy.) It's delicious. I'm also having the best veggie spring rolls I've tasted, and sushi. "Is there any raw fish in these?" I yell to the waitress. A hush falls on the diners. "No fish in here," she reminds me in quiet tones. As Sarah's visions of tofu turkey dance in my head, I ask the waitress to point out the tofu in my meal, so I can have a taste. She hasn't served me any -- must be a strategy, I surmise. But at my request she returns with cold tofu cubes. They taste like cardboard, and the authors agree that it's not the way they would serve tofu to a rookie like myself. "Tofu is like flour, you don't just sit down and eat flour," Sarah says. "It's got to be prepared properly, it's all in what you add to it." The kitchen tries again, this time coming up with strips of fried tofu that look just like barbecued beef. The women watch, in hopeful expectation, as I take a taste. And I try, Lord knows, I try, but it still tastes bland to me. "Maybe it's an acquired taste?" I offer. "The tofu should be cut up and put in a stew," Sarah recommends. I decide that I love everything vegan that I've tasted except the tofu. I especially enjoyed the sugar-, milk- and egg-free chocolate cake made with spelt flour, and let's not forget the carrot cake. I could go vegan, I'm thinking, at least until Christmas Day, when, hopeless cannibal that I am, I'll once again ruthlessly sacrifice a turkey.